The St. Tammany Parish Library, South Slidell Branch is pleased to bring great tidings and joy to you and your kin. 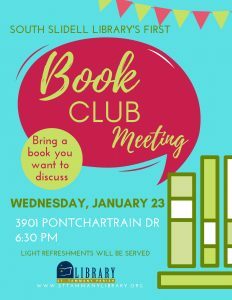 Starting in 2019, the South Slidell Branch will begin hosting monthly Book Club Meetings. The meeting will be headed by the manager, Hilari Farlow. The first meeting is to be held on Wednesday, January 23 at 6:30 PM. Attendees are requested to bring a book of their choice to discuss. The book to be read for next meeting will be determined by then. Future meeting dates will be held on the third Wednesday of every month. Sign-ups are available online via the online events calendar. You can also call the library, or speak to staff at the desk to sign up.